Putting the world to rights with Meles and Gordon. The World Economic Forum is best known for its annual meeting at Davos in the Swiss Alps where, recently, focus has been on the poor state of the world economy – particularly that of Europe. So, the annual Africa version of the event (held last week in the swanky surroundings of the Sheraton, Addis Ababa) must make a welcome change, as the atmosphere was robustly positive. African economies are on the rise, none more so than Ethiopia’s which, if you believe the numbers, (and most informed sources do) grew at between 5 and 10 percent over the past half a decade. Sitting astride this economic growth, and taking pride of place at this year’s WEF, was Ethiopian Prime Minister Meles Zenawi. In an event that boasted such political heavyweights as former British PM Gordon Brown, and private sector luminaries like the Ivorian boss of The Prudential, Tidjane Thiam, whose $600 billion worth of assets makes Ethiopia look like a minnow, I was surprised by how much Meles came out as the dominant figure. A fiercely intelligent man, with a grasp of figures redolent of Brown (whom Meles referred to as “˜Prime Minister’ throughout) he seemed totally in his element. Perhaps it was the nature of the audience. He was never going to have to field too many tricky questions about Ethiopia’s political space, (un)free press or tight government control over telecommunications and banking in front of a room full of CEOs and fellow technocrats. One senses that in certain crowds his statement that “there is no direct relationship between economic growth and democracy” would have got him in to trouble – important players were gnashing their teeth at this but Meles, kingpin of Western policy in the Horn of Africa, knows exactly how much he can loosen his Marxist instincts without upsetting his donors. 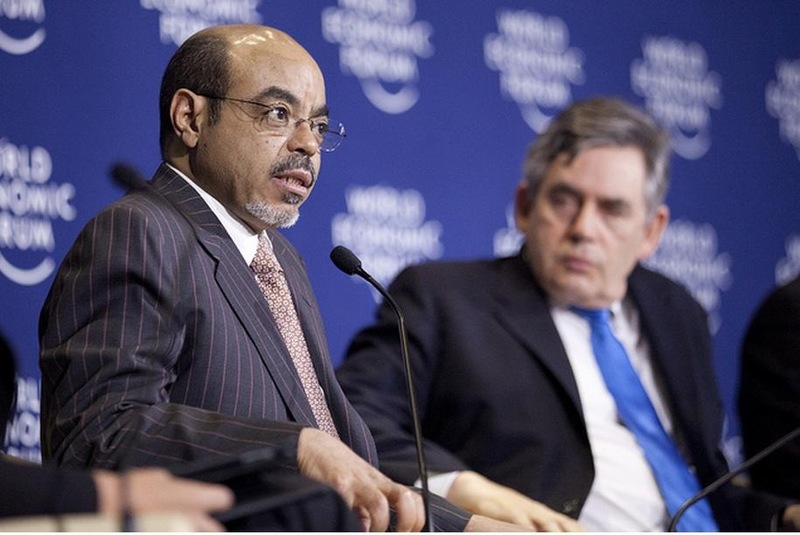 To this end, the above was quickly followed by the rider that “democracy is a good thing in and of itself, irrespective of its impact on economic growth.” When it was asserted that Africa’s post Cold War democratisation was a reason for more recent economic success, Meles scathingly referred to this as “old stuff”. One of the bigger topics of debate across many panels was how public and private sectors can most effectively work together for both economic growth and development. During a discussion on developing African infrastructure, Meles asserted that government would have to lead in the construction of roads, railways, power systems etc because private sector investment in these areas was “miniscule” – the risks are simply too high. Gordon Brown, ever the flexible social democrat, championed the public-private partnership as a means to raise capital for the kind of infrastructure projects that the private sector won’t do, and the public sector can’t afford. There were, however, complaints from a number of voices over how public agencies crowd out a stream of private money otherwise poised to flow in to African economies. Although Donald Kaberuka (President of the African Development Bank) countered that any small private investment that had taken place in infrastructure was because public agencies had brought it in. Whilst Meles asserted that the Ethiopian government would continue to be vigilant over the commercial “˜whizzkids’ who “come in and use instruments that we don’t understand,” Jubril Tinubu, CEO of the Nigerian firm, Oando – an energy servicers provider – countered that African governments shouldn’t be scared of such people, and instead must realise that the private sector is much bigger and can do things more quickly and cheaply than government. In Nigeria, at least, it is government that is the problem. Amid the bullishness about economic growth there was caution from, amongst others, Kofi Annan, who stressed the importance of not confusing economic growth with economic transformation. Much work still needs to be done to make African growth inclusive, and the GINI coefficient must be viewed as a central indicator of effective economic policy. Aside from Meles, several other big names played a significant role in the forum. South African Finance Minister Pravin Gordhan did his international reputation no harm with his measured style, always keeping the most disadvantaged people as the focus of discussion. During a panel on market integration, whilst other panellists were distracted by the bluster of continental currencies and the Trans African Highway, Ngozi Okonjo-Iweala, Nigeria’s Minister of Finance, displayed her characteristic good sense. She pointed out that organic integration, whether it be informal border trade, or the multinational African staff of South African universities, was already taking place outside of big, top-down projects. Okonjo-Iweala is clearly a popular figure across the continent – this was shown by the near universal support her candidacy for President of the World Bank received from her African constituents. Like Gordhan, her instincts seem to be in support of the poor, whilst her keen economic brain seeks to facilitate the free movement of goods and people to unlock commercial potential. The World Bank’s loss is Nigeria’s gain. So what was the prevailing feeling about this year’s WEF? Whilst Meles demonstrated his star quality (with a roguish tendency towards the autocratic and nationalistic) there were a number of other figures of real stature in attendance with claim to positions of continental leadership. Whilst it would be hard to identify a grand narrative, the technical discussion was frighteningly high, underlining the quality of African leadership now available in both the public and private sectors. It’s difficult to think of a panel where a non-African speaker really stole the show, and the most high-profile Western politician in attendance, Gordon Brown, seems to be far better regarded in Africa than he is in the UK. Coming to the continent must be a relief, although it can only be a shock returning home, where it’s been 2 years since anyone referred to him as the PM. Maybe it tells us something about Meles, who can’t seem to fathom that a political heavyweight like Brown would ever allow himself to be removed from power. Hope all is well Magnus.This is so cool; and really easy to read essay. I did not enjoy this article. I am rather disgusted by it. I want to leave a comment all the same, if you do not mind. First full disclosure: I am an Ethiopian. I know what this man, Meles (many Ethiopians prefer to call him “Monster”), did to my country first hand. Please forgive if I am a bit too emotional. Ethiopia by any measure has been an unfortunate place for a long time. Those not particularly familiar with the country expect to see misery on a Biblical scale on arrival. The moment they see people walking upright many people are already surprised. Add to this the shiny buildings, the roads, etc. you are almost overwhelmed. Whatever positive impressions you have, it is clear that it was measured from a very low measuring bar. If you take the trouble to scratch a little bit beneath the surface, you would see only slow motion disaster. This man (whom G. Brown (himself an unmitigated disaster as a prime minister)) affectionately calls Prime Minister is presently solely responsible for this. He is the supreme leader, generalissimo, Kim Jong Il and Ayatollah Khomeini in one. The shiny buildings mostly are owned by his ethnic kin and cronies with both the land and the money to build on looted. He controls both the land and the banks with no accountability. In many cases the loan is written off. But even if some of it is re-paid, the interest rate is way, way below the galloping inflation rate. Either way it ends up being a gift to his cronies. The roads in most cases are built using external loans and grants. Most of the loan is from China in Chinese currency. When the Chinese currency appreciates in the future it will double or triple. Which ever way you look, this man is dragging the country down the drains. With the economy in a free fall, with keeping the rural poor fed is outsourced to international NGOs, and with even the semblance of the basic elements of the rule of law totally abolished, how does he manage to deceive so many people for so long? This is a real, real mystery. Just twenty years ago we had another monster as a ruler. He was doing far, far worse things. Measured against this what we have in Ethiopia may seem to be an improvement. But why should the worst of the worst should serve as a yardstick? Donâ€™t we deserve dignity in our homeland? Thank you for this informative post. I have been disappointed by the news coverage of the WEF, which neglect further disembeds African economics from the global market as an equal player. However, the WEF itself disappointed in failing to take advantage of the general Rising Africa mood. The failure of the organisers to articulate a “grand narrative”, as you are so right to highlight, contributed substantially to this sidelining. This lack of focus was also revealed in its choice of its non-African contingent; I don’t think the organisers applied their minds to finding speakers with a suitable profile, and with something meaningful to say. I’m not sure what Gordon Brown was doing there, and was absolutely mortified to see Bob Geldof yet again being given a platform on which to wax rhetorical, when he has made a substantial contribution to the framing of Africa as victim. I am pleased, however, that Kofi Annan raised the issue of inclusivity with regard to the increased economic growth we have witnessed in the region. But this ideal is must be met by a continuing demand for social responsibility strings attached to corporate investment: Wal-Mart’s entry into the African market was met with virulent protest by South African trade unions. Its CEO Doug McMillon, one of the co-chairs of the WEF, maintains Wal-Mart is all about creating jobs and a prosperous middle class, but yet Wal-Mart laid off 500 workers in its acquisition of Massmart on its entry to the South African market. The South African competition commission and Labour succeeded in getting these workers reinstated along with the creation of a $13m fund for local suppliers. A big question mark is whether African countries can maintain a robust civil society and competition laws to benefit from such investment in a meaningful way. African development will prove to be a challenge and in order to be prescriptively successful requires courageous out of the box imagination. Kudos to Kebede. He put it all correctly. ‘Joro Yalew Yisma’. Is n’t that what they say in Ethiopia to mean ‘Pay close attention’? Mr. Gordon Brown, we are disappointed with you ! The United States, the World Bank, and other states and institutions have shown little or no attention to Ethiopiaâ€™s worsening human rights record. By inviting Prime Minister Meles to the G-8 summit, the U.S government is sending a message that at best shows a lack of concern about the human rights situation in Ethiopia, and at worst, will be perceived as a U.S. endorsement of the Ethiopian government’s policies. We urge your administration to review its policy towards Ethiopia and consider how U.S. government programsâ€”including those pertaining to development and military assistanceâ€”can be re-tooled to advance the cause of human rights in Ethiopia. The U.S. should privately and publicly call upon the Ethiopian government to take credible and immediate steps to reverse Ethiopiaâ€™s policy of human rights repression. Ethiopia should amend the Charities and Societies and the Anti-Terrorism Proclamations to bring them into compliance with international best practices, release all persons arbitrarily detained, including opposition members and journalists, and ensure access throughout the country for humanitarian and human rights organizations and the media.